A common issue that a lot of EMS personnel have issues with, is checking lung sounds. Lungs sounds can be a vital tool to identifying what is going on with your patient, and how to treat them. One thing that we need to discuss, is the difference between Respiratory Arrest, Dyspnea, and Respiratory Failure. 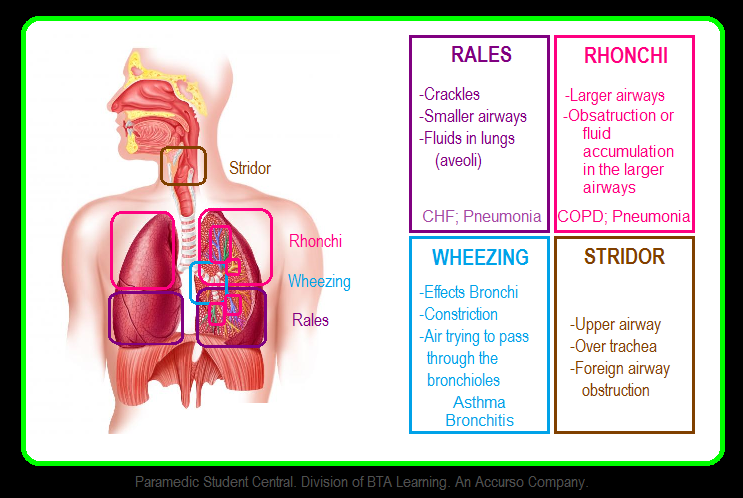 Respiratory arrest is when their a total stop in all respirations. Dyspnea, is when the patient is still breathing, but they are struggling to breath. With respiratory failure, oxygen and CO2 cannot transfer properly, thus sending the patient is respiratory distress, which leads to arrest. Failure is characterized by tachypnea, increased CO2, air hunger, and cyanosis in the lips, eyelids, and fingernail beds. Now let's discuss the types and description of lung sounds. For examples of what each lung sound sounds like, visit youtube.com and type on the specific lung sound. I have made a picture, to help with the identification of lung sounds, based on where you will hear them.